I hope this is and will be the last version of the mod, but I guess next year Abarth Corse will add the "Biposto" into its Trofeo... we'll see. - Nicola Acciarri RFE for physics lessons and advice! 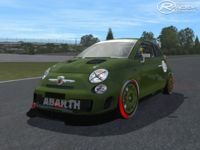 There are currently no setups for 500 695 Abarth (rFactor2). Add a Setup. There are currently no car skins available for 500 695 Abarth (rFactor2). If you are a painter you can share skins for this mod via the Car Skins area. Visit the Spray Booth for painting tips & tricks. All the buds you will find are going to be full of seeds. The marijuana without seeds is a consequence of the commercialization . It is a way to get marijuana with a stronger effect and the whole process has been invented by westerners breeders . And I wonder: if a plant full of seeds has such a powerful effect, how would it be without seeds? Très prisée des pilotes chaque années elle réunit un plateau d'exception et très éclectique. Changed some coefficients following the new available technology of rFactor2.